Cathal Guiomard is a Lecturer in Aviation Management in DCU. Between 2006 and 2014, he was Ireland's Commissioner for Aviation. One of the more remarkable episodes in the recent French presidential election, and with wider lessons, was a heated debate in Amiens between Emmanuel Macron and workers at a Whirlpool factory under threat of closure. While Macron was holding talks with city and union leaders in the chamber of commerce, Madame Le Pen arrived unexpectedly outside the factory gates, took a number of selfies with workers, promised unspecified special measures to save the factory, denounced Macron and was driven off in her election bus. After his meetings, Macron arrived at the same factory gates to face booing and jeering and cries of ‘Le Pen for President’. After explaining why he had met the leaders ahead of the workers (because, he said, leaders of a trade union that behaves responsibly should be engaged with), he promised to answer all questions, and he did for an hour. The following is my attempt to summarise the subsequent questions and answers; it involves some rearranging. Q: Why don’t you close the French border, for instance to imports from Poland where wages were low. A: I won’t close the borders or roll back globalisation because it will cost French workers thousand of jobs if they work for firms that need to be able to export. Q: There no work, it’s too late for us to find other work, we are unemployable. A: Absolutely not true. There is work but it is different work and it requires retraining. Q: Why are companies allowed to pay dividends at the same time as they are closing factories? A: Stopping dividends, or banning factory closures is not possible. It would end foreign investment into France, and all the jobs those investments bring. Q: Our factory needs special measures. A: It is the responsibility of the workers and managers to make a success of the business. It’s not the responsibility of the Finance Minister, who should firmly and even-handedly apply policies and laws that support long-term economic development. Even with the best policies and laws, unfortunately some factories will still close. Macron’s reaction to almost every single thing said to him is an impassioned ‘Non, non, non.’ It is difficult to think of other examples, anywhere, of a politician, during an election, in front of the television cameras, telling voters he would not do what they asked because it would not be in their interests, but would instead support the policies the voters blamed for their difficulties. I won’t do things that won’t work, he says at one point. That’s not the policy I support, he says at another. 45 minutes of the discussion is to be found on the last video link on this page of the En Marche! party website. The first 9 minutes is an argument over why Macron went first to the chamber of commerce, and why he waited until the second round of the election to visit factories such as Whirlpool’s; the policy debate begins after that. In parts of the recording, Macron plunges into the crowd and the exchanges can’t be heard very clearly. The problem with the organisation as it is currently configured is that all senior posts are filled by members who have spent their entire careers in the force. Under that system, there is very little opportunity for critical self-examination. It is about time this changed. In fact, this same ‘closedness’ is widespread throughout the Irish public sector – in the civil service, the semi-states, the regulatory agencies and so forth. While these bodies may not be quite as sealed as the Gardaí are, true outsiders are rarely found. One result is what Dan O’Brien calls the ‘decent skin’ problem – excess sympathy for under-performers. A given manager/CEO is acknowledged to do their job poorly, but as they are a decent skin on a human level, there is reluctance to judge them too harshly. A second result is ‘capture’, in its many manifestations. Concerning the regulatory aspect, recruiting a proportion of high-quality foreign staff is a substantial barrier to capture generally as well as, in my experience at least, adding to what The Times called a culture of ‘critical self-examination’ in an agency. Even if the persons concerned struggle to pronounce some phrases (e.g. Aer Rianta, An Bórd Pleanála). A tiny society, where practically everyone is someone’s cousin, on a tiny island, where practically everyone is someone’s neighbour, is at risk of a culture where the indigenous flinch from holding failures to account. One way to compensate for the costs of smallness, capable of reasonably rapid application, would be to aim to have a minimum proportion of senior managers in key organisations recruited from abroad. Outside the central bank it is hard to think of examples where this has happened. Many aspects of air travel now taken for granted derive from the obscurely named ‘Third Aviation Package’ of air travel liberalisation measures that took effect on 1 January 1993, nearly 25 years ago. The impact of these measures – areas of success and failure, and areas still needing resolute action – will be the broad theme of the European Aviation Conference to be held in Dublin (for the first time in Ireland) in November. The conference will be hosted by DCU, home of the Dublin Aviation Institute and of undergraduate and postgraduate degrees in aviation management, on Monday and Tuesday November 13-14 November. Updates will be available as arrangements advance here. On the following two days, DCU Business School will host a COST meeting on air transport and regional development (ATARD). The COST webpage here will provide additional information in due course. The third package liberalised two main areas. Airlines were allowed to fully determine their own ticket prices and obtained an unrestricted right to offer air services to other EU states. The package replaced the arcane ‘bilateral air service agreements’ that preceded it – but that still dominate international air travel. Academics and others with an interest in these events can contact me in DCU should you wish. Before Christmas, John Fingleton tweeted a link to a talk by John Kingman, outgoing second secretary of the Treasury. In the speech [here] Kingman reviews what the Treasury had achieved to improve the performance of the British economy over the decades since Nigel Lawson’s 1984 Mais lecture, which argued for a switch to have microeconomic policy seek to promote growth (supply side) and macroeconomic policy control inflation (demand side), a reversal of the post-war policy. He estimates less than 10% of Treasury staffing was subsequently devoted to supply-side policy and the talk discuss the institutional challenges of internalising the new supply-side role. – science, innovation and universities; he points out that the UK has far more top-ranked universities than all of the rest of Europe and the whole of Asia. In discussing the failures, Kingman distinguishes areas where the solution is known but the public has not been convinced (planning, migration), and ones where the ways to ‘crack’ the problems are just not known (effective non-elite education, distinguishing between investments that will prove to be grand projets rather than plonkers). A comparable review of policy successes and failures Ireland would make for valuable reading but, at a high level, some of the UK’s successes are patently not ours (elite universities, vigorous competition enforcement – tackling ossified oligopolies), while some of their failures may have been avoided here (migration) to date. How to fit the enclave MNC sector into an evaluation is not clear. Lots of supply, albeit exaggerated, but possibly disguising problems in the non-MNC economy. PS Some similar themes (from a regulatory perspective) were discussed by John Fingleton in a talk last December to the IIEA here. 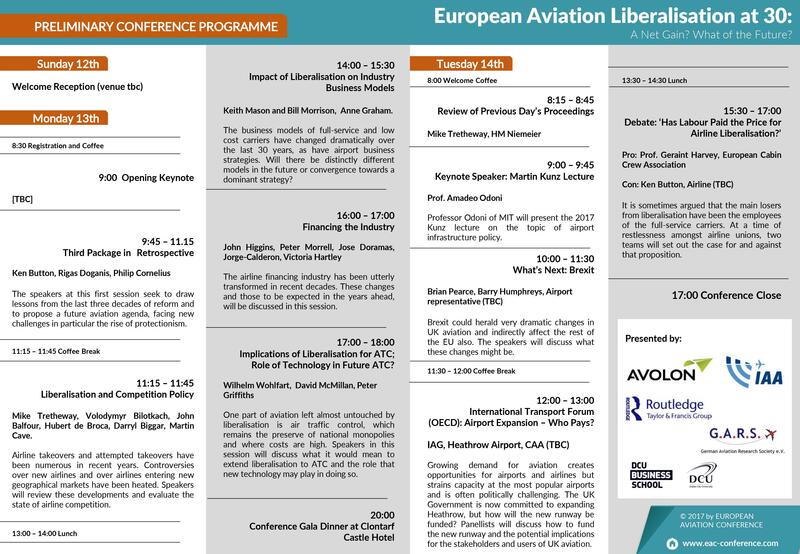 The programme for the third European Aviation Conference, on the general theme of aviation infrastructure, is now available. One topic will be the forthcoming report of the Davies Commission, on expanding airport capacity in the South-East of the UK, though many other issues relating to airport and ATC infrastructure will also be covered. The conference takes place at Schiphol airport on 6th and 7th November. There is a substantial conference fee discount for students. As usual the EAC is preceded by a more academic meeting of the German Aviation Research Society (GARS), which attracts aviation researches from across the globe; more information will be available at www.garsonline.de nearer the date. A tangled though remarkable story behind the proof in the mid-1950s of the existence of a competitive general equilibrium (Arrow-Debreu, as it is known) is summarised in a recent posting on economicprincipals and revised (rather drastically, it must be said) here (scroll down to ‘A correction’). There are strong echoes of the controversy over the proper academic credit for the discovery of the double helix structure of DNA. In the Economics case, the problem was compounded by a very slow refereeing process while rivals worked on a related research paper. Economic Principals is itself an interesting website reporting on topical issues as well as presenting non-technical interpretative overviews of controversies in economics, often disentangling the intellectual, institutional and personal issues. One example, amongst many, relating to the 2011 Sargent-Sims Nobel Prize, is here. The full archive is online. Below are links to materials from the competition, regulation and privatisation session allowing, as with similar threads, for views on the topics and contents of the session to be gathered together. A very central theme of the presentations and discussions was how reform might stimulate growth and thus reduce the costs of austerity. Part of Doug Andrew’s presentation on governance is related to the privatisation thread already on the blog here. And, as regulated firms engage in investment, Colm McCarthy’s presentation on investment here could be read alongside some of the presentations from this session. Although there are no slides from John Fingleton’s talk on competition, there is is a link to a closely-related paper, and you may, in any case, listen to the podcast of his (impassioned) speech, which is to be found from about 24.00 minutes into the recording. Economic Growth – How Can Competition Policy Help? Today’s Irish Times contains a column by Dan O’Brien, based on his new book, which makes some interesting claims about possible links between the Irish constitutional order and what Dan O’Brien characterises at a uniquely Irish pattern of economic performance: slump-slump-boom-slump. It seems like a topic worth adding to the mix in this forum.